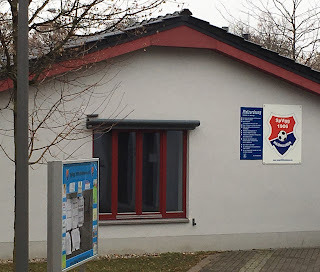 SpVgg 1906 Haidhausen is an amateur football club from the German city of Munich who were formed after the merger of SC München von 1906 and FC Haidhausen on May 23rd 2008. 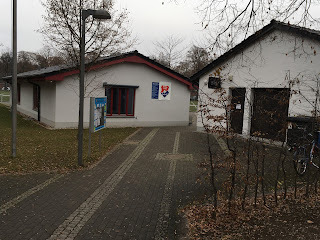 SC München von 1906 is a sports club from the Obergiesing district of the city. In 1920 the football division of the club was formed for the first time, with future FC Bayern München and German international player Lutte Goldbrunner among the players. In 1926 a group of enthusiasts met at Amanns Bierhalle to set up FC Germania, who moved to become the football department of SC München von 1906 in 1927. With around 500 members, the club was one of the most prominent in Munich. The team negotiated to play their games at the Sportplatz an der Emmeram-Str./Martinstraße home of FC Stern. Players from FC Sparta, FC Fasangarten und FC Deisenhofen joined up to strengthen the first team at SC München von 1906. In 1929-30 the club won one of the Munich C Class Divisions, before going on to finish as runners-up in the B Class behind champions Fußballabteilung Grünwald. The youth department emerged following the War years, introducing a young Franz Beckenbauer into a career in football. His brother Walter Beckenbauer along with future German international Rudi Steiner started out at the club. Legendary German international Max Merkl was also a member of the SC 1906 club for many years. The first team was invited to play the German national team in a game of one hour in the build up to the 1954 World Cup; only going down 2-1. The youth team pulled off a huge shock in 1955 when they defeated the youth side of FC Bayern München to be crowned champions of the Münchner Meisterschaft. In the 1956-57 season the club became champions of II. Amateurliga, going on to reach the I. Amateurliga Südbayern, after the league extended to eighteen clubs. The clubs home pitch consisted of red cinders at this time. The beloved 06er Platz home ground was nicknamed Kampfbahn Rote Erde; which translated means the Battleground of Red Earth. The club continued to play in amateur regional football for the following decades before the merger, with the new SpVgg 1906 Haidhausen continuing to play at 06er Platz. SpVgg 1906 Haidhausen will play in Bezirksliga Oberbayern Ost in the 2017-18 season. My trip to Munich was into its third and final day. After covering some amateur clubs in the west of the city the previous afternoon, my Friday morning had led me south. After visiting SpVgg Unterhaching I headed back on the S Bahn where I alighted at St.-Martin-Straße. A walk along the side of Ostfriedhof Cemetery took me to the ground which was located between St.-Martin-Straße and St.-Bonifatius-Straße. The basic venue had hard standing round the artificial pitch, with high netting behind either goal. The near clubhouse side had a patch of running track and long jump facilities. 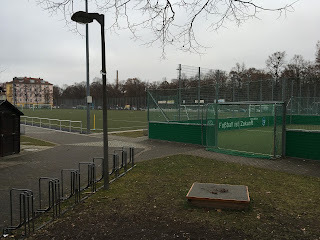 Once I’d taken my photos I wandered across to the Ostfriedhof tram stop where I jumped upon the number 15 service to Tegernseer Landstraße, where the Grünwalder Stadion was located just across the road.